If you love rubber stamps, rubber stamping parties let you socialize with others who share your passion. Rubber stamping parties are quickly becoming popular among scrapbookers, card makers, and paper crafters of all ages. Socializing: Rubber stamping parties offer a chance to socialize with your friends. For busy moms, these gatherings are an opportunity to share a love of crafting with others and enjoy a few hours of "kid-free" entertainment. Education: Parties provide a chance to learn new techniques. If you have questions about embossing, chalking, or stamping with different types of ink, rubber stamping parties are as informative as they are entertaining. Inspiration: For many crafters, seeing rubber stamp projects that others have completed is the best way to inspire creativity. Rubber stamping parties will give you the inspiration you need to take your projects to the next level. Shopping: If you don't live near a large craft store such as Michaels Crafts or Hobby Lobby, rubber stamping parties are an opportunity to buy the supplies necessary for your projects. In addition, most parties showcase products that are coordinated to take the stress out of matching your stamps to your paper and embellishments. 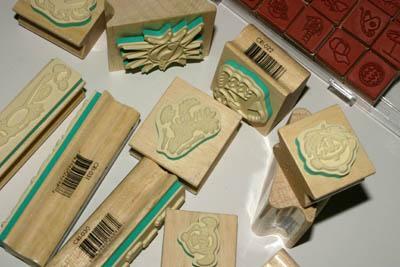 Most rubber stamping parties are events organized by direct sales representatives for various crafting companies. Stampin' Up and Close to My Heart are two of the best known direct sales companies with a large selection of rubber stamps. You can find rubber stamping parties in your area by visiting these company websites to search for local consultants. Representatives for direct sales companies often recruit crafters to host rubber stamping parties. If the sales from your party reach a specified dollar amount, you can earn free merchandise. Be honest about your intentions. Make sure your guests understand the event is a home party. Regardless of how you feel about these events, remember that there are many people who simply don't enjoy home parties of any type. Don't invite anyone who doesn't have a genuine interest in rubber stamp crafts. It's fine to invite both beginning and experienced crafters to your party, but guests with no interest in rubber stamping will just keep everyone else from having fun. Don't pressure your guests to buy more than they can afford. Be respectful of people who are on a tight budget. Stick to a schedule, especially if your guests have left their children with a babysitter and must be home at a specified time. If your guests don't know each other, take the time to make brief introductions. Consider serving snacks and drinks, but avoid anything that will be too messy. Online parties are becoming a popular alternative to traditional home parties, especially for crafters who have busy schedules and friends in many different locations. Online parties take place in Internet chat rooms, with a hostess who describes various rubber stamping products and leads a short project demonstration using a web cam or a series of digital photos. Many crafting websites have separate areas where members can advertise these online rubber stamping parties.